I like running the less populated parts of the West and Midwest. I used to run a triangle from Spokane to Wichita to Phoenix or LA and then back to the Northwest. I liked that a lot. Right now I'm getting used to being home every night and weekend and running mostly two-lane highways in a 300 mile radius. It's pretty nice. It wouldn't hurt my feelings at all if I could stay running from Jackson MS to Fontana CA and all of Texas. I love those lanes out there. You put me in SC GA TN AL MS LA AR TX NM AZ CA and I'm happier than a pig in...you get the point. 35 in TX is nice. Other than going through and around San Antonio, Austin, and Dallas/Ft Worth, it's a nice, easy, and long drive. Lot of miles to be made on it. Side note: Beware of the major construction on 35W and 35E going through Ft Worth and Dallas respectively. The uneven lanes make it difficult to keep an empty trailer steady in the lane. Man I love running in Texas. Try taking the 130 toll out of San Antonio to bypass Austin. It brings you back out on 35 just south of Temple TX and makes for a little quicker trip north. 10-4...I don't mind running up there as long as I can get an empty and a pre-plan out of there. I don't mean to sound picky but I love running interstates 40 20 10. The fuel cost is reasonable and the miles are relatively good. Got my new truck and have a few questions. Depends on where you put the TV. I've seen people put it on the shelf above the refrigerator space and that's like 20 inch. My trainer had hers on the bottom bunk foot wall and had a 36 inch. Once saw a guy with a 42 inch he hung on the ceiling above the windshield lol don't know what year his was lol. He complained cause to test his students he had to take it down. Of course these are condos not the prime lightweights. Could probably get a big one on the wall if you push the top bunk up. Thanks Rainy. I'm not going to go all out with 42 inch. Probably just get a 19 inch smart tv and link it to my phone for YouTube and Hulu. Danielsahn...of course they did. 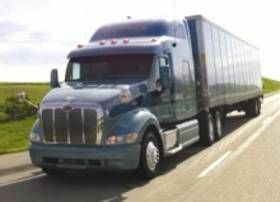 KLLM is a lease purchase company and only about 15 percent of all the drivers are company. I'm not telling you what to do nor do I promote either side because you're going to get out of this business what you put in to it. You have to find what best works for you and take advantage of the opportunity given to you. I meant to say thank you by the way. Congratulations on your graduation and upgrade. I take it your driving for Werner? No...I drive for KLLM. I just haven't changed my Avatar yet to my profile pic. Finally finished school and upgraded this week. My truck is a 2017 Freightliner Cascadia and I was wondering what size tv goes in the space provided? Also, what other items do you recommend putting in the truck to make life on the road fun and comfortable? Anything on that menu is fantastic and the salsa is dynamite. On our way to California we stopped at a little mom and pop truck stop in Plateau TX just before you get to Van Horn and inside there was a little mexican diner, nothing fancy, but the food was absolutely incredible. I'm sure you've all been to your local mexican restaurant and ordered your favorite plate of what not and when home thinking it was good but not great, I know I have. This place had the best mexican food I've ever tasted and I can assure you when im traveling across I-10 this place is going to be a regular stop. There was even an old Swift driver sitting at the counter telling me this is the only place he stops at when he's in west Texas. CHECK IT OUT!! I love listening to all the slang and made up terminology. Some of the women were just as funny. Hey, do you drive for Werner by any chance? I think thats one of their Pete 387s in that pic you have for your avatar on here. Please correct me if I am wrong. No.. I drive for KLLM. Thanks Serah. We're in a log jam in Atlanta right now and listening to some of this CB chatter is better than stand up comedy. Hey congrats Renegade! Good luck with with your trainer! I leave with my trainer at 8:00am tomorrow morning and I'm excited to get out there make some money. I'm sure the next 6 weeks is going to fly by. What should I expect from my trainer for the next 6 weeks? Thanks G-Town...I really appreciate it brother. Thanks Rainy...I'm really excited about getting out there learning the tools of the trade. Orientation is Monday - Wednesday and then I leave with my trainer for 6 weeks. I'll keep y'all updated on my progress. Oldschool...I just didn't want you, Brett, or any of the moderators and members to think I was bringing any negativity or ego to the page. I've always been humble, respectful, and willing to learn from the first day I became a member of Trucking Truth. I can assure you nothing has changed. I can tell you from first hand experience that those instructors at KLLM'S driving academy don't play either. It was tough and it gave me even more appreciation and respect for the men and women I'm about to share this career with. I think I may have worded what I meant to say the wrong way. What I meant was that I hope my trainer has confidence in my commitment and learning abilities. I know I have miles and miles to go before I'm a proficient driver and didn't mean to imply that I have learned all I need to know to become a safe and successful driver.